Get ready for an exceptional reggae night out in the spring of 2019! Certainly the good vibes will be at the rendezvous given the poster REGGAE UNITED # 1! 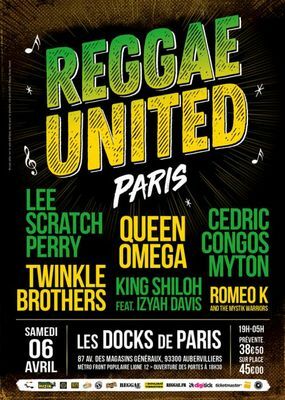 Parisian reggae music fans can smile again. This good news is a pleasure and falls right at the moment when reggae has just been registered by UNESCO in the intangible heritage of humanity! REGGAE UNITED # 1 echoes this recognition and sets the tone for raising the values of love, peace and freedom even higher and stronger. It celebrates living legends and new generation for our greatest happiness to see gathered on the same stage our icon, the inevitable Lee Scratch Perry, Queen Omega, Cedric Myton Congo, Twinkle Brothers, King Shiloh Sound, Izyah Davis, Romeo K & The Mystik Warriors. There is no review about Reggae United, be the first to leave one !